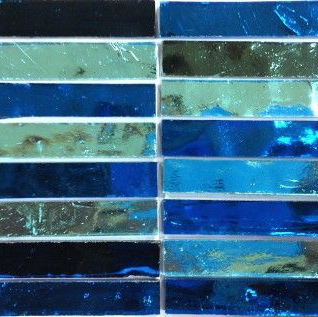 Hand cut slivers of mineral coloured mirror 1cm wide and 6.5cm long in dazzling colours and finishes mounted on paper sheets for easy removal. Perfect for mini and micro mosaic and for all the mosaic artists that love the beauty of stained glass but not the work to cut those giant sheets down to tesserae. Each tile is 1/3 inch (10mm) wide, 1.5 inches (4mm) long and 1/6 inch (3mm) thick. 1 sheet = 150 tiles and 1 square foot.